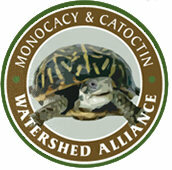 Join the Monocacy & Catoctin Watershed Alliance on February 27th at 1pm for their upcoming meeting featuring an exciting presentation by Patriot Land & Wildlife Management Services, Inc., as well as partner updates and networking. Patriot Land & Wildlife Management Services, Inc. will be presenting on their on-the-ground experiences with innovative concepts for ecological restoration and natural resource management. Selected practices include: Utilizing goats for invasive species control; wildflower & pollinator plantings; a new custom cover crop planting service; Biohaven® floating islands; and alternative agricultural production concepts like diversionary wildlife food plots and the incorporation of sustainable agricultural practices on managed lands. Please RSVP to Heather Montgomery. Christmas has come and gone, but it is still the season for giving. As you get the last few days out of your beautifully decorated Christmas tree and begin to ponder the best way to haul it out of the house without creating the inevitable mess, it’s also time to think about what to do with it once it’s back outdoors. Kick it to the curb for sanitation to come pickup and trash? Haul it to the dump? Throw it in the woods along a slow country road (we hate when people do that)? Drop it off at Patriot Land and Wildlife in Dickerson free of charge where we can repurpose it for wildlife habitat all across the area for little critters like rabbits, ground nesting birds, and even fish to enjoy? OF COURSE! What better sense does it make to complete the circle by harvesting a tree for you and your family to enjoy during the holidays, then return it to nature in a still usable state for wildlife to utilize once again! These repurposed trees provide nesting areas for birds, hiding areas for rabbits and other ground-dwellers, and even shady areas in the summer for fish. 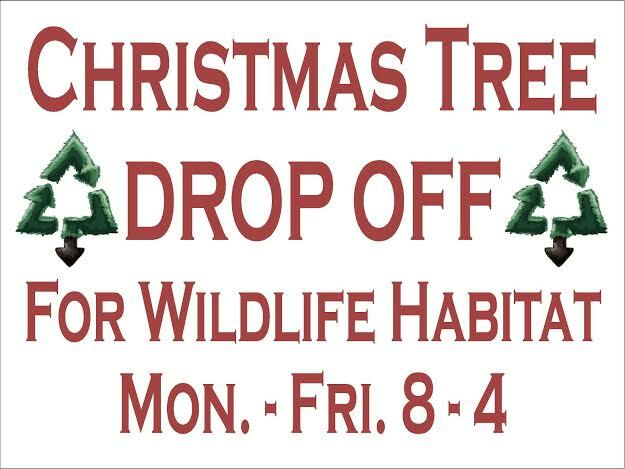 So bring your trees on by our office between 8 AM – 4 PM, Monday – Friday. 22300 Dickerson Road, Dickerson MD 20842. Please proceed through the blue gates and place your tree in the pile past the board fence on the left side of the driveway. Please remove all non-organic material (stands, tinsel, etc.) from the trees prior to drop off. We will use these trees across the local area to create new and enhance current wildlife habitat. It feels good to give back, doesn’t it? Happy Holidays from the Patriot Land and Wildlife family to your family! Call us at 240-687-7228 if you have any questions! Living within the Chesapeake Bay Watershed, and more specifically, a stone’s throw from the Bay itself, we are fortunate to have a variety of people helping to improve it. For decades now the Bay has been suffering poor health from pollution and nutrient overload and virtually every species of wildlife has suffered the consequences. While it is true that the Chesapeake Bay Watershed consists of 6 States, Marylanders feel the repercussions the hardest, because all their environmental problems run right into our Bay. To make matters worse, Maryland’s booming development due to its proximity to Washington, DC is aiding in the loss of crucial wetlands which help to filter and remove these pollutants and nutrients from the equation. New technologies are giving conservationists new tools to do battle with, though. Implementing clean water initiatives is tough work, but somebody’s got to do it, and we have the perfect backyard to prove their worth – the Chesapeake Bay. A recent article in Maryland Life Magazine by Donya Currie highlights some of these very issues-“With its 41 million acres of watershed and 200,000 miles of shoreline, the Bay is the most-studied estuary—which, by definition, contain salt water, fresh water, and brackish water, a mixture of both—in the world”. For a comprehensive read about these new technologies being implemented, check out the attached link to the Maryland Life article “Water (for the) World”. Floating Island Partners Hard at Work in Midwest! Cool Videos from Minneapolis. Here are 2 cool videos featuring our working partners in conservation Blue Wing Environmental Solutions & Technologies as they along with Midwest Floating Island and American Society of Landscape Architects show what impacts one group of regular citizens can have on their own water quality issues. These videos are of a Floating Island launch in Minneapolis as part of an effort to help solve a local lakes water quality issues. Contact Patriot LWM or CLICK HERE to learn more about Floating Island Technology! 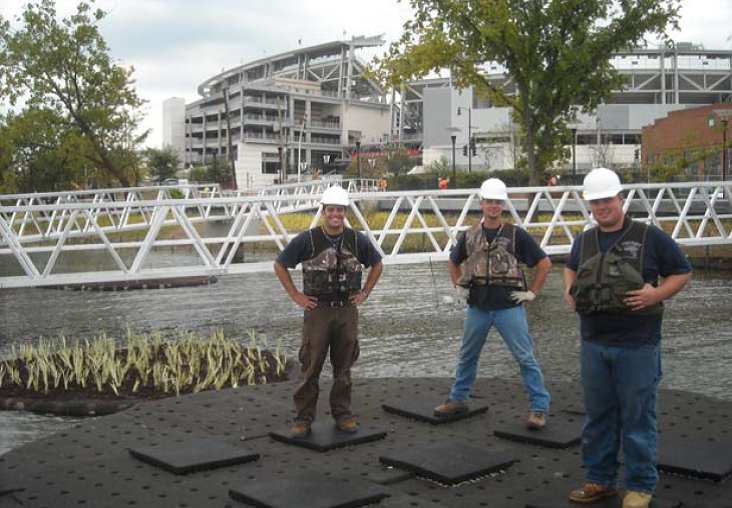 A few years ago, Patriot Land and Wildlife was fortunate to be involved with an innovative water quailty improvement project in Washington, DC on the Anacostia River. Teamed with Bluewing Environmental Solutions and Technologies, Patriot LWM helped install several BioHaven Floating Treatment Wetlands at Diamond Teague Park in DC, with the intention of providing much-needed water quality improvement. These BioHaven islands are capable of removing as many nutrients from the waterbody as 6 acres of natural wetlands. Diamond Teague is just across the street from the Washington Nationals baseball stadium and is a popular riverside destination for ballpark patrons, among others. The dual functionaility of water quality stewardship and ornamental landscaping allowed for a great project to occur, and lots of attention drawn to the problems suffered by our waterways. Author Mike Cronin of “The Daily” spotlights the project. The Kanias founded their company in 2005. Today they have seven manufacturers worldwide and 4,000 islands in use around the globe. Customers pay roughly $27 per square foot and may order any shape or size of floating island, which can be used in rivers, ponds, lakes and even the ocean. Kevin Hedge, a wetland scientist and partner at Blue Wing, sees the synthetic islands as more than just a savior to an ailing environment. “The floating islands are an ecological-restoration tool that also can be an economic-recovery tool,” he said. Lanshing Hwang, the Maryland landscape architect who designed the island park in Washington, called it “an innovative approach — particularly for places that don’t have wetlands. It has long been known that an overpopulation of deer has negative effects on your vehicle when they wander into the roadway infront of you, or your flowers when the deer make their way to your yard, but a study from the Smithsonian’s Conservation Biology Institute is pinning a new victim on this overpopulation, our forests. Biologists looked at the effects of deer overpopulation on forest regeneration and how that relates to the growth of invasive species of plants. What they found is sure to be a wake up call for the ecological community who must now look at wildlife management as another tool to protect and ensure the health of their natural community. May 23, 2011 – As an ever-rising population of white-tailed deer have bumped up against their human neighbors in the D.C. area, the results haven’t been pretty. There were an estimated 88,000 deer-vehicle collisions in Virginia, Maryland, D.C., and Delaware last year. But beyond the roads, experts say the deer are also having a major impact on forests, which are unable to replenish themselves to nurture the next generation due to the deer population’s eating habits. 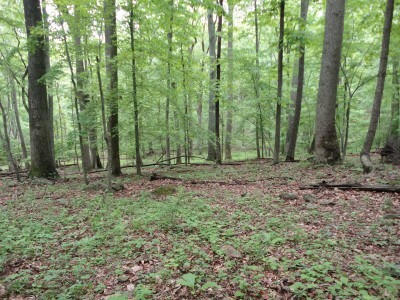 To illustrate this decline in forests during the past several years, a group of scientists blocked off a chunk of woods to the deer more than two decades ago. It’s called an exclosure, and it’s a place where no deer have trod for decades. 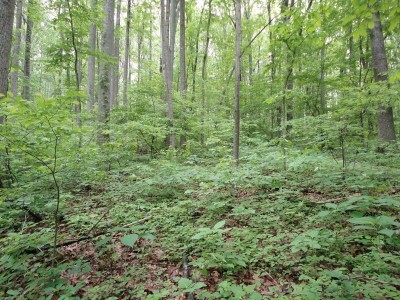 Back in 1990, scientists at the Smithsonian’s Conservation Biology Institute in Front Royal, Va., closed off 10 acres of forest with 8-foot high fences to see how the land would evolve without its furry friends. That is an understatement. The deer side of the fence has a carpet of grass, a shrubby looking thing and some large trees — things that are either too big for deer to eat or among the very few plants they don’t like to eat. Inside is practically a jungle, with dozens of different almost exotic looking plants are tumbling over one another, many of them young trees. That simpler world is an aging world. Really, it’s a dying world as far as forests go. “The future is not good. There are no teenagers, there’s no young adults,” McShea says of the trees and other foliage. “Everybody’s a mature individual. Whereas, inside this fence you have the complete profile of ages. You have youngsters, you have teenagers, you have middle-aged adults, you have the old trees. These results of the exclosure, although striking, are what scientists could have predicted. One of the surprising things they found, however, is that deer allow invasive species to flourish. “The Japanese stilt grass is just coming up now as a highly invasive annual grass,” says Norm Bourg, a plant ecologist with SCBI. The Japanese-origin grass carpets the floor outside the exclosure, but inside, there are many more native species present. With fewer native plants outside the exclosure, there are fewer birds there that depend on them for nests and food, and there are also fewer mice and chipmunks when they have to compete with deer. But it wasn’t always this way. One hundred years ago, deer were nearly extinct in Maryland and extremely rare in Virginia. Today’s ubiquitous food trend of “buying local” was the norm back then, and hunting was an industry, says McShea. In the early part of the 1900’s, newly minted state game departments rushed to the rescue, banning or regulating hunting and setting up parks. The result is that today, there are several million deer, and, as McShea puts it, “the flip side has happened. “They’re hitting too many cars, there’s too much gardens being eaten, the forest succession is changing,” he continues. “We’ve got to dial that back a little bit. Deer aren’t evil, McShea is quick to emphasize, but they have no predators now and they need to be managed. States currently rely primarily on scheduled hunts, where the public is allowed to come in and take out deer. That works well on parkland to some extent, but it doesn’t work on private property or in federal parks, which have been slower to adopt aggressive management. “We have time for that, we don’t have to make a decision this year,” he says. But we don’t have decades, he adds. Trees don’t live forever. Maryland is home to a rich variety of waterfowl species. We’ve all seen Canada geese honking their way from pond to field. Some of them endure the winter migration, and some of them are year-round residents who call Maryland home. Ever seen a wood duck? Well, much is the same with wood ducks, arguably the most beautiful duck native to North America. Wood ducks nest in tree cavities near water and utilize wetlands as their home to raise their young. Unfortunately, as urban sprawl occurs, more and more of these wetlands are being destroyed, limiting the wood duck’s habitat and success in Maryland. Don’t lose faith. A lot is being done to bring the population back to where it once existed. You can become part of the effort too, and it doesn’t take much. Wood ducks suffered a serious decline in the late 19th century for a variety of reasons, including habitat loss and market hunting for their meat and plumage. Because of the Federal Migratory Bird Treaty Act of 1918, market hunting was ended and measures were enacted to protect remaining habitat. Wood duck populations began to rebound in the 1920s, and the development of the artificial nesting box and its implementation by Federal and State governments and local wildlife enthusiasts in the 1930s began providing an additional boost to wood duck production. 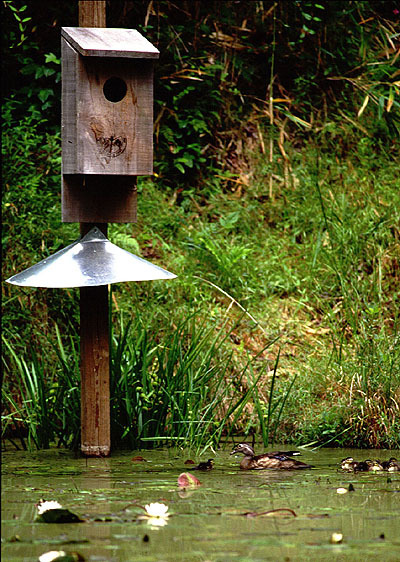 The hope was that the ducks would utilize the “cavity” characteristic of the boxes to nest. The ducks did, and they made an astounding comeback. Nesting sites are only half the battle, though. Woods ducks also require wetland habitat that provides them with shelter, food, and protection from predators. If you have a wooded stream or pond on your property or if you live along a Chesapeake Bay shore with woods nearby (which is alot of you! 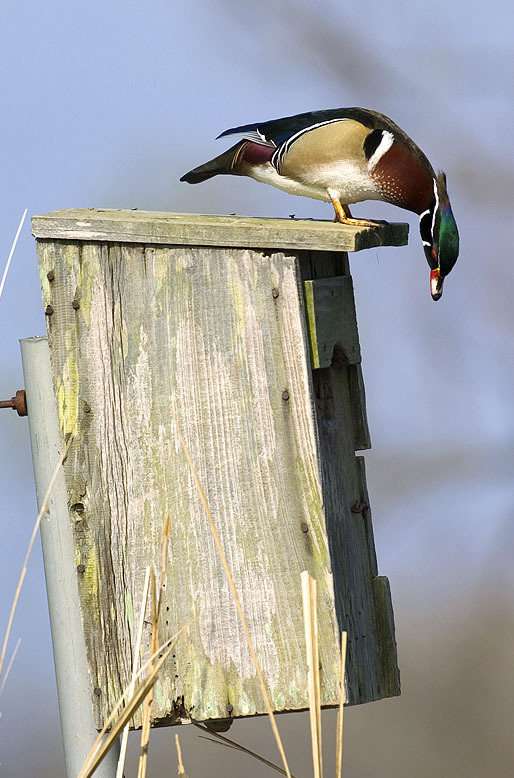 ), you may be able to attract wood ducks simply by constructing a nest box. 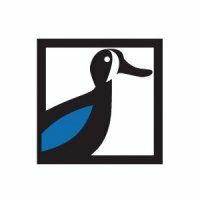 Building a wood duck box is simple, inexpensive, and there are plenty of plans you can find online that detail designs, placement, etc. Do your h omework. The Maryland Wood Duck Initiative, an all-volunteer effort, aims “to enhance Maryland’s wood duck population and to generate a greater appreciation of the wetland habitats in which they live by advocating and demonstrating the merits of a “best practices” approach in managed nest programs.” State agencies like the Department of Natural Resources, conservation organizations like Ducks Unlimited, and companies like Patriot LWM are other important resources for anything wood duck related and are more than happy to provide you with information and help develop your wood duck plan. So, now for some more timely information. What are wood ducks doing right now in Maryland? Wood ducks nest from April to June, so right now is a great time to get your nesting boxes built, or cleaned out if you already have boxes (if you’re anything like me, you’re tired of being cooped up in the house and are itching for a reason to get outside and do something). Add a few inches of wood shavings (don’t use sawdust because it can suffocate the ducklings) for nesting material, attach the boxes to poles (don’t forget the predator guards! ), and place them around forested areas near the water for when they arrive. You’ve now become a part of the effort! The rest is up to the ducks. Females often search for a nesting site early in the mornings; therefore try to face the opening of the box towards the east so the opening is more visible from morning rays of sunlight. Try to avoid facing the opening towards the prevailing wind for the area as this will cause undo stress on the nesting birds. 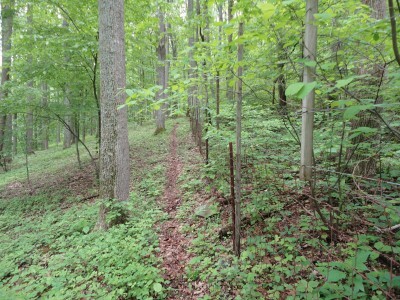 Limit the amount of underbrush under the boxes to reduce predator access to the poles. 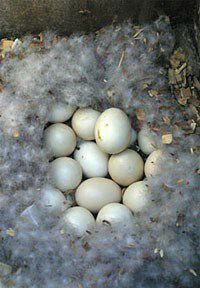 If a wood duck finds your box suitable for laying eggs, in about 1 month 9-12 eggs will hatch and, within 24 hours, the ducklings will use their sharp claws to climb to the nest box entrance and fall to the ground or water. Once on the ground, the femal e will lead the ducklings to the nearest body of water (they won’t come back to the nest, don’t take it personally). Wood duck young can fly in about 60 days from hatching; meanwhile, their mother looks after them and protects them from harm*courtesy of Maryland DNR*. It’s always a good idea to check your nesting boxes once during the nesting season to clean them out and add new nesting material. Besides doing some housekeeping, a visit during the nesting season will show if your nesting boxes have been productive and improve the odds of the box being used again during the season. If you’d like to get a fully assembled wood duck box and predator guard contact Patriot LWM at 240-687-7228.